For Labor Day weekend this year, we spent a couple days doing some more exploring in Calaveras County, this time at Calaveras Big Trees State Park and California Cavern. 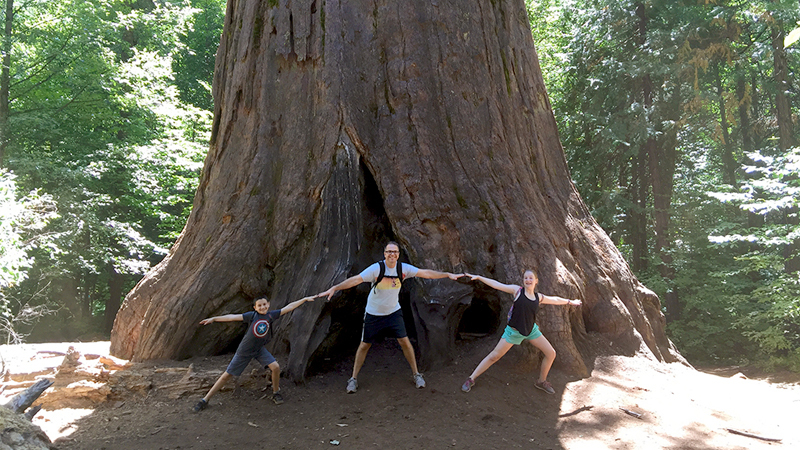 We spent the entire day Saturday hiking at Calaveras Big Trees, exploring both the South Grove and the North Grove, and some swimming areas along the Stanislaus River. One of the reasons our family loves hiking so much is because it’s quiet and peaceful. We get a real break from crowds, noise, and technology, and we’re able to just relax and enjoy the amazing beauty that surrounds us. Knowing that the North Grove Trail was going to be crowded and loud, we decided to kick off our day hiking the longer, more remote South Grove Trail and save the North Grove Trail for later in the day when it’s less crowded. While the North Grove Trail (when dry) is stroller friendly and wheelchair accessible, the South Grove trail is dusty dirt, rocky at times, and not accessible. It traverses Big Trees Creek, winds through a pristine stand of sierra redwoods, and crosses an old logging railroad right of way — and because you’re allowed to go off-trail in this area, you can get up close and personal with some magnificent Giant Sequoias, including the Palace Hotel Tree, the Agassiz Tree, the Moody Group, the Smith Cabin Tree, Old Goliath and the Portals. The South Grove Natural Preserve contains about 1,000 large sierra redwoods — also known as Giant Sequoias — about 10 times as many as the more popular North Grove. The largest redwood trees in the Calaveras Big Trees State Park are found in the more remote, tranquil, less visited South Grove. Many Sierra redwood groves were severely disturbed following their discovery by settlers in the late 1800s, but lack of human influence in the Calaveras South Grove Natural Preserve offers visitors a unique opportunity to visit and study the ancient forest ecosystem in its primeval condition. Unlike the Calaveras Big Trees North Grove, once you are within the boundaries of the preserve, you may hike off the trail. There are seven maintained hiking trails in the park — two in the South Grove — that offer views of the Giant Sequoias, the rushing Stanislaus River, and the Lava Bluffs formation. This trail travels through the South Grove Natural Preserve, home to about 1,000 mature Giant Sequoias, and the largest trees in the park. This moderate trail consists of a 3.5 mile loop through the lower part of the grove, with a .75 mile spur trail leading to the Agassiz Tree — the largest in the park — for a total of 5 miles. The South Grove Trailhead parking area is located nine miles past the park entrance station on the main park road. This 2.5 mile, round-trip, moderate loop trail travels to a grove of young Giant Sequoias that were plated in the early 1950s by summer park caretakers and conservationists Owen and Adrienne Bradley. To access the trail, start hiking on the South Grove Trail. Just after crossing the bridge over Beaver Creek, look for a trail sign and box with trail guides and follow the trail to the left. When a few of the Giant Sequoias along the South Grove Trail fell, they were left in place to decompose. A piece was cut out of the fallen trees to maintain the trail. I knew because of it’s length, the Calaveras Big Trees South Grove Loop Trail, would be less crowded, but that is a complete understatement. When we arrived there were only a few other cars in the parking lot, which meant we had almost the entire trail to ourselves, only coming across a few other couples and one other family. The trail leaves the parking lot near the restrooms and gently weaves through the brush and an open meadow before reaching a beautiful bridge spanning Beaver Creek. Looking down from the bridge, you have a view of the 130 million-year-old granite rock that underlies the South Grove and forms the backbone of the Sierra Nevada. In the grove, it remains almost completely covered by soil and alluvium, but here the creek has eroded those layers, exposing the rock. The scenery surrounding the creek is breathtaking. The trees were spattered with fall colors and the water was babbling down the creek under the bridge, wrapping around and flowing over the large, smooth, flat granite rocks My kids were going nuts! They all but begged for time to stop and explore the creek. So we crossed the bridge, climbed down to the creek bed and explored the area a bit, giving my son some time to rock hop across the water — one of his favorite things to do when we’re hiking near a creek. Then, with promises to spend some more time at the creek not the way back, we grabbed our backpacks and hit the trail. The first 1.5 miles of trail is a moderate, steady climb from the parking lot to the start of the loop trail, with a gain of 260 feet in elevation. The trail hugs the mountainside and is mostly uphill. It’s a dusty hiking trail that will give your legs a pretty good good workout. Soon we reached the start of the South Grove Loop Trail that passes through the lower part of the Giant Sequoia grove. Here you can choose to follow the trail right or left — go right. Not only are all of the most impressive groupings of Giant Sequoias found on this stretch of trail (early reward for the kids), but it gets all of the uphill hiking out of the way first. At just over one mile in length, this section of trail first climbs 200 feet, then gently descends back to the start of the loop. Halfway around the loop trail, you will find an spur trail leading to the upper grove, the Palace Hotel Tree, and the Agassiz Tree, which at 250 feet tall and 25 feet in diameter at 6 feet above ground, makes it largest tree in the park. At just over 0.5 mile in each direction, this trail gently climbs 100 feet. If you’re hiking the South Grove Trail and thinking about skipping this side trail to save a mile of walking, don’t do it! The trees you’ll see (and get to walk inside of) on this stretch of trail are spectacular. The hike back, because it was all downhill, went really fast. We were back at Beaver Creek in no time and grabbed a spot in the shade near the creek bed to relax and have a snack while the kids rock hopped and played. Brian, Natalie, and Carter also took off their shoes and socks to soak their feet in the freezing cold water. But then our stomachs began to growl, so we followed the trail back to our truck and headed to the picnic area for lunch. The whole South Grove Trail hike took our family just over three hours. Also in the The South Grove Natural Preserve, is the Bradley Grove Trail that takes you through a grove of 150 30-year-old Sierra redwoods growing on the far side of a small meadow, as well as a redwood tree nursery area along the railroad tracks. The 2.5-mile loop trail begins on the left side of the South Grove trail just after the Beaver Creek Bridge and gains 280 feet in elevation, with several moderate climbs and descents. Hiking the Bradley Grove Trail allows you to observe the ongoing processes of forest recovery. The entire trail passed through an area that was logged in the early 1950s by the Pickering Lumber Company. Although there were plans to log the huge sugar pines found in the South Grove, Pickering Lumber was persuaded to keep the operation out of the grove itself. You can also view the Railroad Tree and the Lone Sequoia — two giant redwoods that are far from the main South Grove area. Calaveras Big Trees State Park is located at 1170 E Highway 4, Arnold, CA 95223 (four miles northeast of Arnold on Highway 4) in Calaveras County. Wear tennis shoes or good hiking shoes. While the North Grove Loop Trail is flat and mostly on a wooden boardwalk, the rest of the trails in the park aren’t. They are steep, rocky, and at times slippery. This isn’t the time for flip flops or sandals. Pack water and snacks. While there are some concessions like the $1.00 ice cream and popcorn near the North Grove and the Visitor Center, that is it unless you want to leave the park and eat in Arnold. Be sure you pack enough water for your everyone in your family to stay hydrated, and pack a picnic lunch and plenty of healthy snacks. Get to the park early. Calaveras Big Trees State Park gets very crowded on the weekends. For the best experience and the fewest crowds, be sure to arrive at the park early in the day, or plan on visiting during the week. Know your restrooms. The only normal, flush restrooms are located near the Visitor Center. All other restrooms are vault toilets (pit toilets) and they are only at the trailhead parking areas and picnic area parking lot. No dogs on trails. Dogs are welcome in the park, on leash, in developed areas like picnic sites, campgrounds, roads, and fire roads (dirt). Dogs are not allowed on the designated trails, nor in the woods in general.